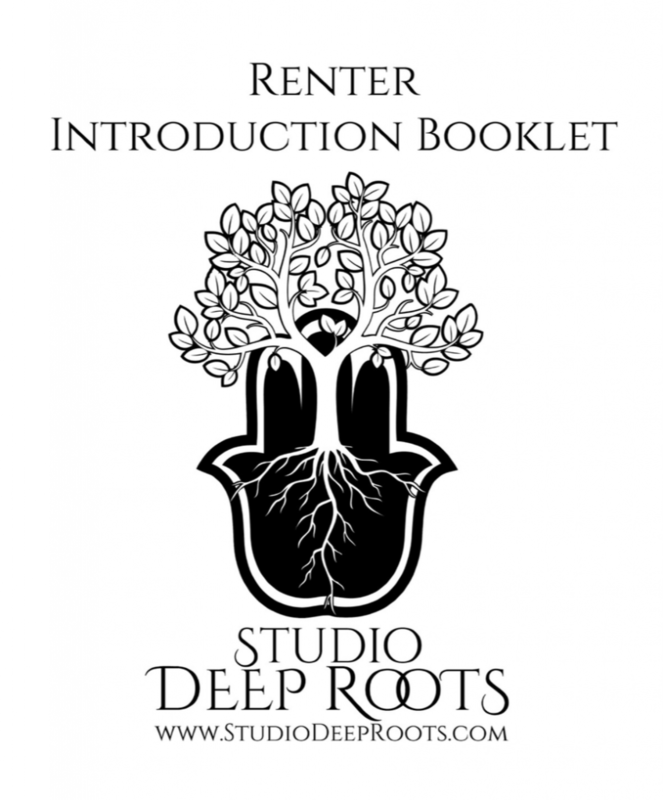 Thanks for your interest in renting at Studio Deep Roots! Let us tell you a bit about our studio to see if you think we could offer you a good partnership. 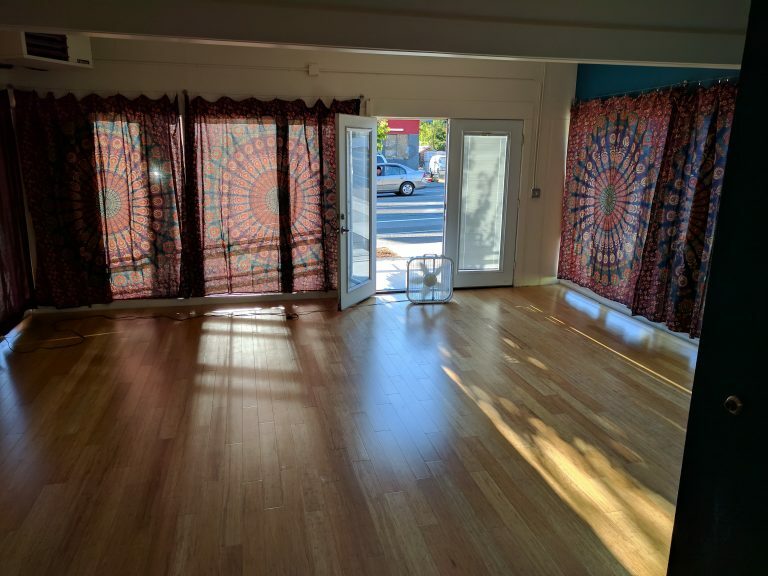 Studio Deep Roots and Deep Roots Dance, LLC fosters an inclusive, supportive, LGBTQ+ safe space and seek renters of the same mindset. We cultivate a body- positive, welcoming environment, with the vision of of cross-pollinating our disciplines, professionally and artistically. We hope to build a symbiotic relationship between all who rent, work, and play here. We welcome reliable, professional, fun-loving and kind-hearted artists and healing arts practitioners to join us at Studio Deep Roots. Well-behaved pets and therapy animals are also welcome. Make our home your home! Our policies laid out here and in our rental contracts are explicit so there is clarity of expectations and responsibilities. We’re not as type-A as this all may come across—I as a director and we as a group tend to be pretty laid back and flexible as a general rule— but we’ve learned a few things from all the places we have rented ourselves over the years, and have found that clear communication and shared purpose are the foundation of a healthy working relationship. 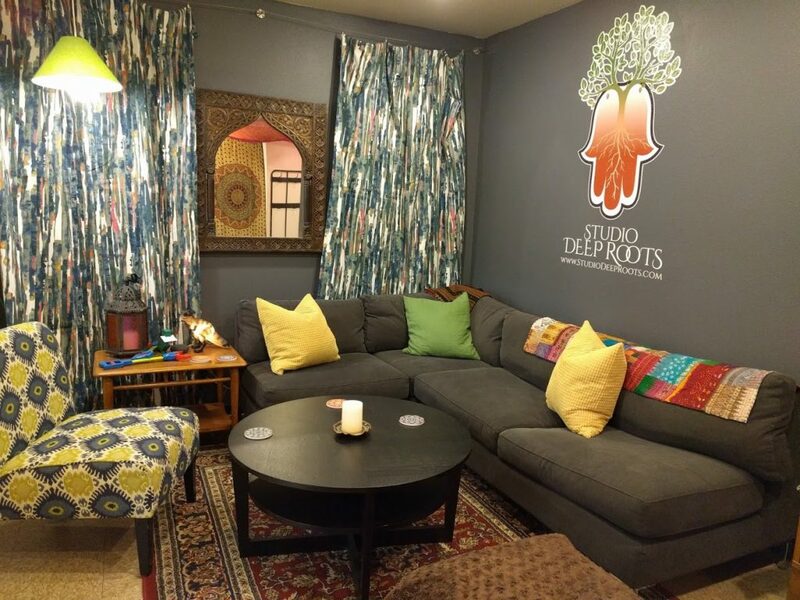 Our hope is that you feel comfortable and supported at Studio Deep Roots, and it all starts with establishing mutual intentions and a strong foundation of trust. Thanks for taking the time to read this in its entirety, and please don’t hesitate to ask any questions you may have. Not all studios are alike. We really hope the way we are different from other studios will be a good fit for you. Here’s a short list of what we’re offering (some pertain to contract instructors only, as noted). Both studios have sound systems which accept mini-jack capable devices, and cubby storage for your and your students’ personal items. Practitioner rooms are furnished with some light storage and seating; you must provide your own massage table, chair, or work-specific furniture unless otherwise specified. The lounge, waiting area, and dressing room are available to you and your students or clients before and after your rental period. Just be mindful of classes that may begin before or after your rental period. 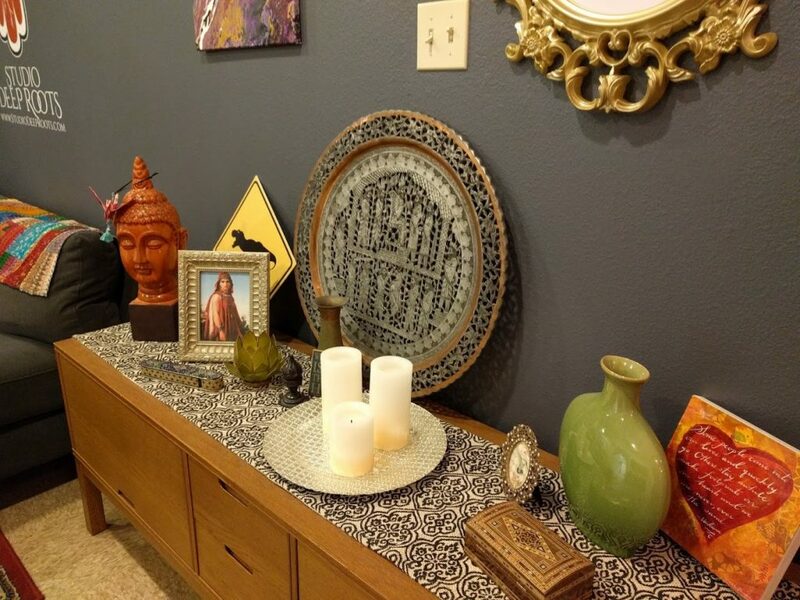 We like to think that you and your students and clients will take opportunities to slow down, connect, and share in this space together. As a shared space, the upkeep and cleanliness of the facility is our collective responsibility. We hope you take as much pride in renting here as we do hosting you. We don’t expect you to show up with a mop and bucket every week, but attention to details on a daily basis by all of us will ensure our facility looks it best at all times. And if you see something that needs attention and are moved to do a little extra, we welcome any efforts toward cleaning and upkeep. If you find anything you are unable to attend to, please e-mail us or leave us a note so we can make sure it gets taken care of. remove any food/smelly items from the premises at the end of the rental period (we love wild critters, but prefer they stay outside the building, thanks). There is a “How Can I Help?” sign in the lounge we encourage you to take a look at. We want to instill, in our students and clients as well, a sense of ownership of the space so we feel collectively inspired to keep it beautiful. Many hands make light work! At the end of your rental period, it is your responsibility to make sure the facility is ready for the next renter and/or closed up safe and tight. This means walking the facility to see if any other renters are still there and making sure any areas you and/or your students and clients used is clean and organized. Studio rentals are one hour in length. Your rental period must include any set-up and break- down time. The end of your rental period must conclude 5 minutes before the end of the hour, to allow transition time between classes/sessions/the next renter. Ongoing renters are charged a flat rate per month based on the number of regular weekly class slots they rent, averaged at four (4) slots per month. 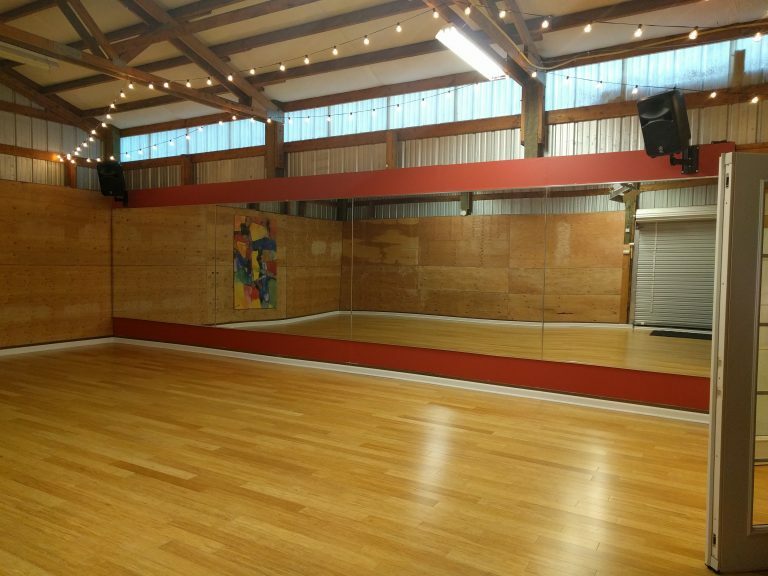 For instance, when teaching weekly classes, one may rent the Warehouse from 6-8pm every Monday at a two-slot rate, or rent on both Monday from 6-8pm and Wednesday from 7-9pm at the four slot rate. Your slots are reserved for you each month whether you use that time or not, plus the more slots you reserve the better discount you receive on your rate. It also does not increase in months where you may have five weeks of a given rental day. This allows you the greatest flexibility in your personal scheduling, reliability for your students, and predictability in your budgeting. A three-month contract is required for these discounted flat rates to apply, which is electronically billed monthly. Contracts automatically extend in three-month increments unless notification is given one month in advance of the contract end date to change or cancel the contract. Renters may convert to a month-to month if they prefer, subject to the higher non-contract rate. Rental periods (slots) begin at the top of the hour unless otherwise arranged (90-minute classes and longer class/workshop times can be arranged as is possible; inquire for more details). At this time, the larger Warehouse studio is rented in two-hour minimums during prime time, M-F 6pm-10pm. All instructors and practitioners must carry their own liability insurance, and all students must fill out a liability waiver. For details on required deposits, billing and cancelation policies, insurance/waiver requirements and more, please refer to the full Studio Rental Agreement, available upon request. Ideal for up to 25 participants in a movement-based activity. Can seat 60-70 in theater configuration for performance. At your request we can add you to our web page and calendar and promote your classes, workshops, and/or services through social media, including a link back to your web page and/or PayPal account to register for your classes/events with you personally. This service is free for our contract renters. For non-contract and single day renters, there is a $15 one-time fee per event or class session listed/advertised. Renter must provide written copy and high quality images as desired. Contract renters may also submit blog posts for consideration to be included in the studio blog, and blasted through the studio newsletter. This is a great way to expand your reach within our growing community, letting your unique voice be heard as our studio grows. Inclusion in the blog is at the owner’s discretion, and may be edited for accuracy and length, giving favor to dance and wellness related content to support the Studio Deep Roots mission and focus. Writers will be given notice and right of refusal on any and all edits. Our goal is to offer diverse views and ideas on our blog to benefit our shared community, and amplify the voices of our artists-in-residence. All dance studio renters are also given access to basic supplies, sign-in sheets you may wish to use for your own record-keeping, and waiver forms each of your students must sign and keep on file with the studio. For all renters, if you wish for your students or clients to be added to the studio mailing list to be kept appraised of studio happenings, new blog posts, etc, submit a copy of your student sign-in sheet or client names and e-mails to Shay to be added. Anyone may opt out at any time. We never share this list and will never sell it or use it for purposes outside of promotion of the studio and related activities. A library of magazines, books, and videos is ever-growing. While we ask that none of the materials be removed from the facilities, they are free for use by anyone who cares to while enjoying the lounge. We also welcome any contributions to the library should you have any to share. We keep a stock of hot drink fixin’s and snacks in the kitchenette for you, your clients, students, and/or guests to enjoy. We only ask that the counters be wiped down and if any utensils, mugs, or other items are used, that they be washed before the end of the rental period. We ask that renters and students/clients bring their own water bottles, which can be filled in the sink with the Brita filter, though we have plastic cups and/or some limited bottled waters in the fridge for those who need it. We encourage current renters to use one another as substitutes as is reasonable, so our students can get to know other teachers at the facility and cross-pollinate our ideas and inspirations among our students. Bonus: you will know they already have the necessary insurance and contract in place. We also encourage trade-in-kind for classes and/or services, as is reasonable, such as allowing other contract dance teachers to attend your class for free or a reduced rate, or offering classes in trade for massage. Finally, we hope to hold open houses, sampler workshops, and haflas periodically, in which you may be invited to teach or perform to help promote you work and the studio. Fostering a collaborative, supportive space is what we’re all about. If you have ideas about how we can better support one another and work together, share your thoughts with us any time. Now that you have an idea of what we’re about, what do you think? If you’re interested in moving ahead with working with us, we’re happy to share our rental agreement with you, arrange a studio tour, and answer any questions you may have. E-mail us any time.